Hoe hoe grow: Tree following - a tale with a tragic ending ? My fig tree is not happy and I have a horrible feeling it is my fault ! Its new leaves are very sparse and at the moment, it looks as if it will stay that way. There are some buds, but not that many. What leaves there are look healthy and disease - free, but the overall impression of the tree is that it is not thriving as it should. So, what could have caused this poor spring growth ? A cold winter, perhaps ? A new and undiagnosed Fig-tree defoliating disease ? Or a lopper-happy gardener? Sadly, I think it is the latter which has caused the problems!! 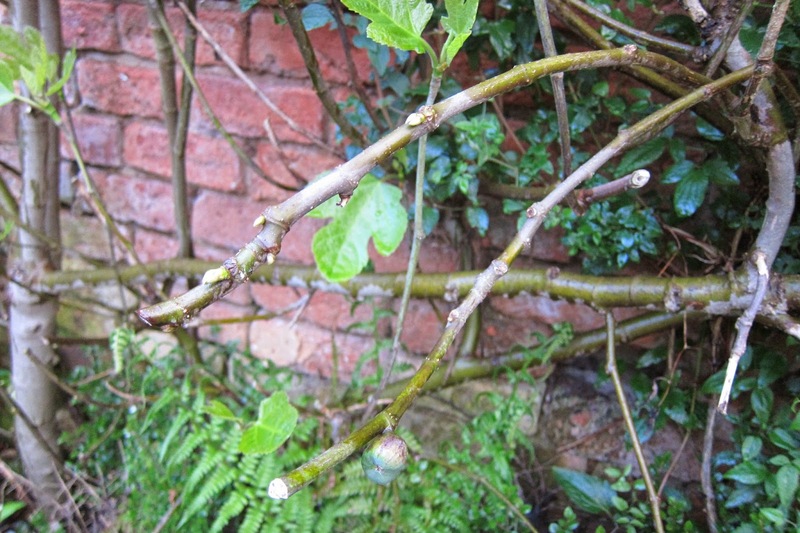 I think I pruned too late and too hard last autumn and my poor fig tree is paying the price. So, how will it fare throughout this season ? Will it pick up, limp on, or die ? There are an awful lot of bare branches, with no leaf buds at all. I can't blame the cold weather, as our winter was unbelievably mild, and, as you can see, the tree is very well protected by two walls, a brick one and a stone one. It is sheltered from the worst of the wind and the frost, and has survived happily for about ten years. 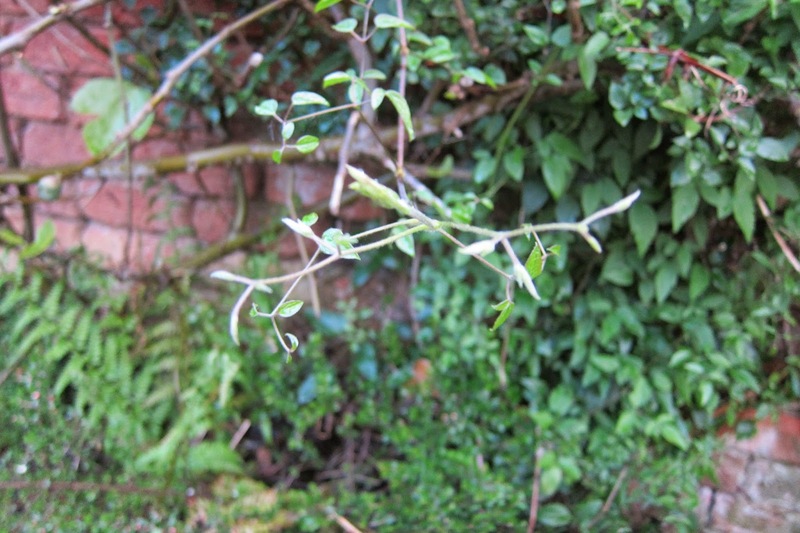 There is a 'Polish Spirit' clematis which grows through the fig tree, and I pruned that back too, just before it came out of dormancy. It is fine and putting out lots of new shoots, which I need to tie in, as they are casting round, desperate for something to twirl round. 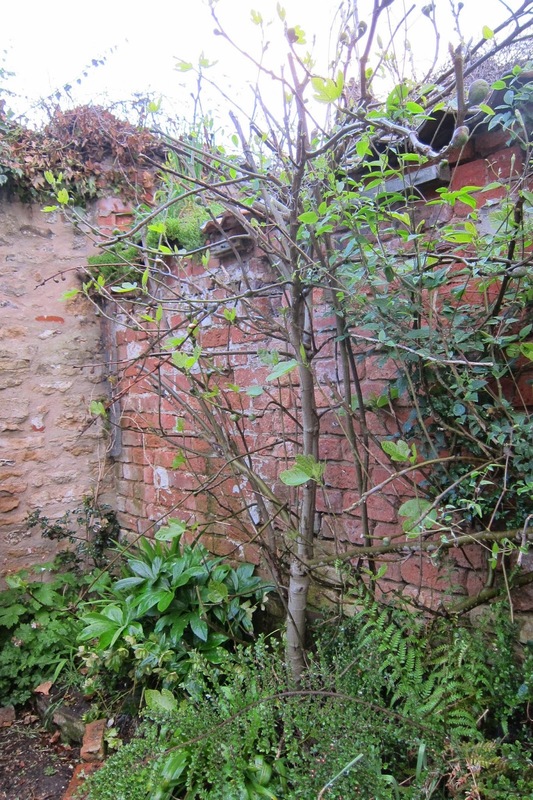 As this area is south facing it gets the best of the sun, and the walls retain the warmth, making a good environment for the fig tree to flourish in . Until a lopper - wielding gardener attacked it anyway ! There are quite a lot of small figs, and I must admit to not knowing whether they are ones which failed to ripen last year, or whether these small figs will grow and mature this season. I should be using this opportunity to research my fig tree and find out more about how it grows ... and how to prune it ! This post is linked to the 'Tree following' meme over at 'Looseandleafy'. If you hop across you will find lots of different trees to read about. Oh, I do so hope you are right ! Do you speak from experience ... have you got one in your garden ? Hello Jane, those young green shoots look pretty and at the same time promising. I think the tree could still grow. Maybe the weather too cold now. The tree has been gaining popularity here. Many have started looking for a fig to plant. Hi Stephanie, I so hope you are right and my poor tree improves later in the season. Are you tempted to have a try as they are gaining in popularity ? Actually I have ever planted fig on my home grown. This plant is the most interesting plant on my plant's list to be planted in my garden this year. I hope your fig tree going to be better and grow so well, then give you a plenty fruits.. Thanks Endah ! I will be interested to hear if you go ahead and plant one of your own. 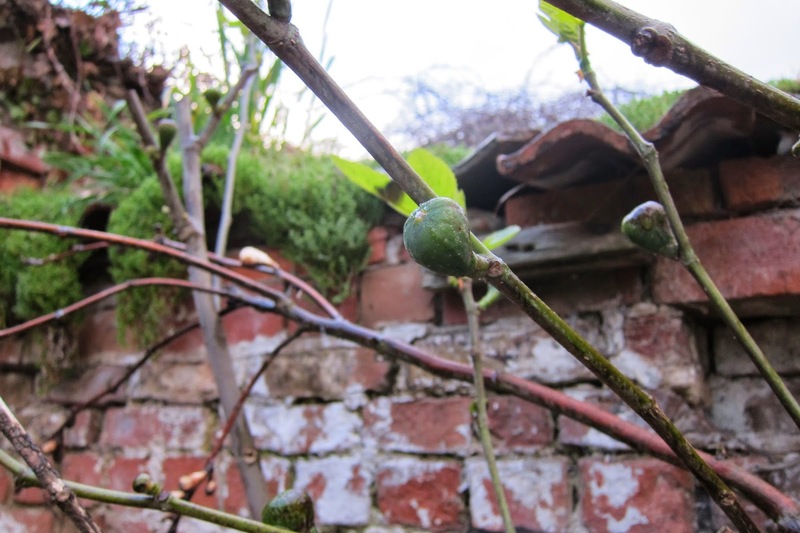 Figs are very resilient - we have two that have come back from the dead. 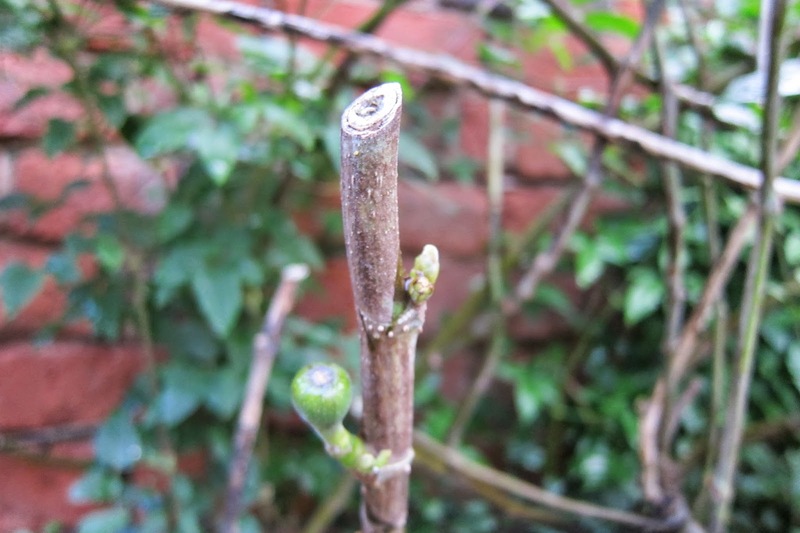 Search for fig on my blog to see photos etc, As Mark and Gaz say it is still early days, One small point though on the photo of the pruning you have cut well away from a bud. I'd trim this back to just above the bud with the cut sloping away from the bud. The bit left at the end could die back and cause a problem. Hi Sue thanks for your optimism and for pruning advice - not my strong point I'm afraid ! It has survived intact so far, so I am hoping it makes a dramatic comeback! Thanks Daniela, you sound very certain ! I like that ! I think this story will have a happy ending. Wouldn't gardening be boring if we always knew the ending though? Hi Sue, it certainly would be boring if we knew the outcome every time! gardeners all share the same characteristic - optimism ! If we weren't optimistic, I'm sure we would give it up immediately! Technical point - you've put the URL for last month's post in the Tree Following Link Box so I've taken the liberty to of adding the URL for this one. Hope this is ok - and if it is, it might be best to remove the other. Hi Lucy, thanks for pointing that out, and for changing it for me! I'll remove the old one asap. Weirdly, we have only had average rainfall here over the winter, unlike many parts of the uk, so although your theory may be very sound, we haven't had the volume of rain to account for the changes. Hi Jane, such a shame, but I would be surprised if your fig didn't recover over the couple of years, they are meant to be pretty tough. though as Sue suggested I would trim back to a bud where there are longish bits above, and perhaps a good feed? 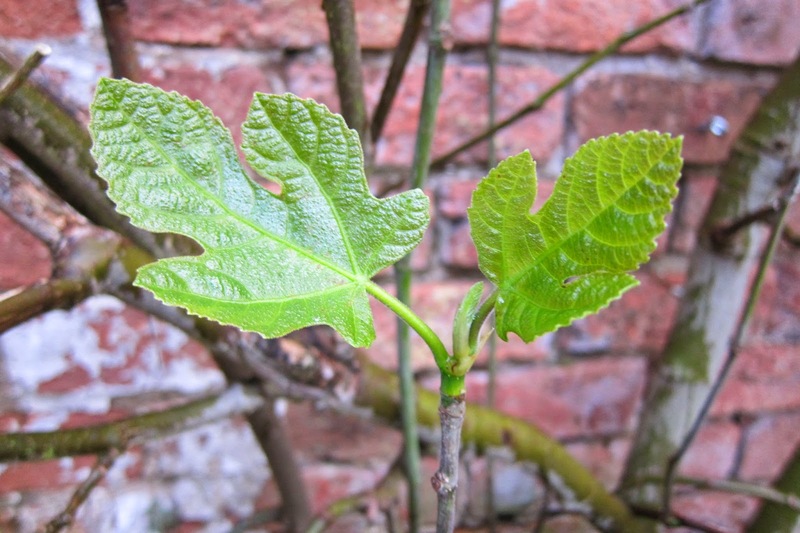 Will be really interesting to watch what happens to it over the rest of the year, thank you for sharing, I am thinking about getting a fig for a sheltered south facing wall so it is very relevant. Hi Janet. Hope you are proved right ! This meme will hopefully spur me into action so that I prune properly and then record the results ! We get lots of figs usually, and they do ripen well. Go for it ! Keep up hope! And take whatever lessons you learn from this to become an even better gardener in the future. We've just moved our fig tree from a large tub (where it has been for a few years) to the ground. It seems happy with the change - so I'm going to take this as a sign that they are quite resilient and your own tree will revive! Hi Wendy, everyone seems to say how resilient they are, and that has been my own experience over the years. To be honest, I have hacked it back like this every year and it has never suffered before !! Hope yours says 'thank you' for the move and repays you with lots of lovely figs ! 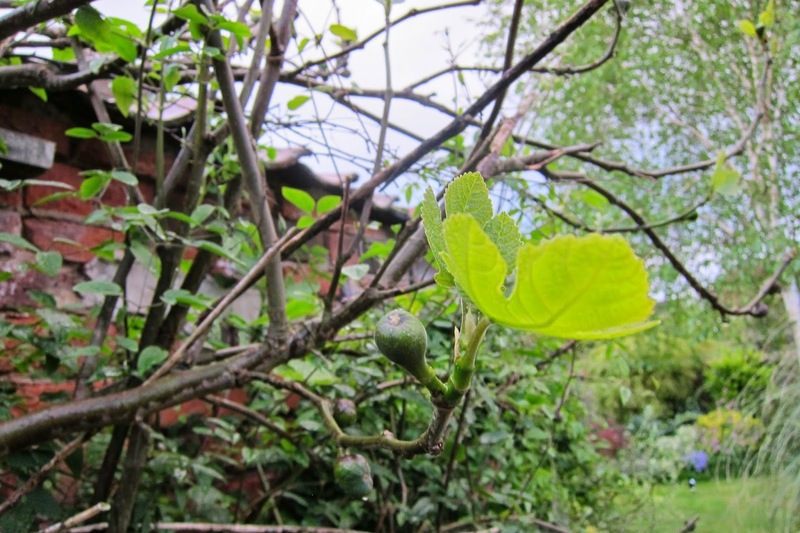 A non-gardening friend of mine had a fig tree growing in a pot which became too large for their small backyard, the next-door neighbour had some room up against a brick wall close by the old outhouse. He offered to plant it but could only get down a small distance so did no more than take it out of its pot, place it as deep as it would go and pile up the soil round it to the old planting level leaving it about 9" proud of the true ground level. Three years later it is still thriving having never even been checked, tough as old boots! Hi Rick, that is music to my ears ! They don't like to be cosseted , as your story illustrates. I presume it is still fruiting well as well ! I am completely ignorant on the subject of figs (except when it comes to eating them), but your fig tree has my best wishes for a full recovery! Thankyou for your good wishes ! I am certainly feeling my way along with my poor long suffering fig tree ! I think your fig tree will survive, I'm sure Jane. It has some buds, is all right. You might prune dry branches only. We have cold winters here and every spring I cut the dead branches and the trees grow and grow. I have no experience of fig trees but I reckon they are hardy old things and will survive however badly you think you have pruned it - hope it all comes to 'fruition' okay. Hi Elaine, funnily enough I was in a nursery today, looking at the state of their fig trees and they were as sparsely foliated as mine, so I feel a lot better having seen them ! maybe mine does this every year and I just haven't noticed !! Thanks for popping over btw ! Hi Jane, thank you for visiting my blog and for following me. Fig trees are very hardy, I'm sure yours will survive and come back good and strong next year. I have to admit I'm always pruning at the wrong time or forgetting completely! I'm loving your blog. I hope its OK if I add you to blog list? Hi Jeanne. Pleasure to pop across to visit, you and , yes, of course, you can add me to the blog list. That would be very kind ! 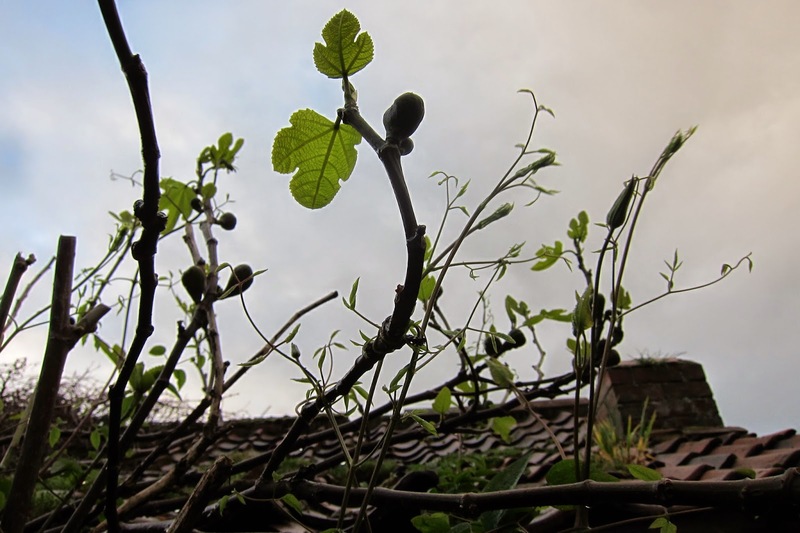 I think fig trees must be programmed to survive through tough times - like haphazard pruning !